Get soaked and cool down this summer with Soakin’ Summer Series on Wednesdays running June through July at Evans Towne Center Park. The event will feature water slides, inflatables, and other water fun! For more information, click here. If you are looking for an educational activity and also want to get the kids outdoors, then bring the kids to Reed Creek Park and Interpretive Center. Here you can stroll along the boardwalk while taking in an active wetland environment and visit the interpretive center for educational programs and animals on exhibit. For park hours and programs, click here. Take your horse obsessed princess or cowboy to Hilltop Riding Stable at Fort Gordon for a horseback adventure and educational session. 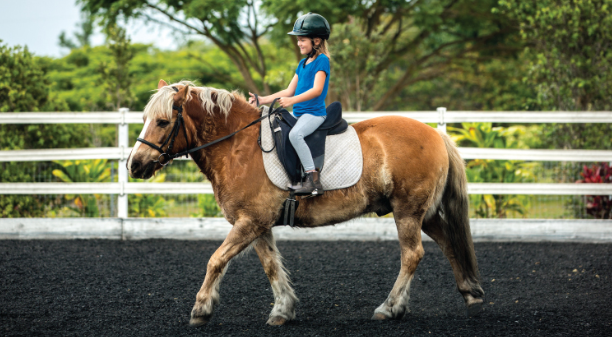 Hilltop offers something for all ages and beginners to more advanced riders. Hilltop is open to civilians. Click here for more information. Climb mountains or train to become a ninja at Active Climbing. The facility offers many indoor climbing options for all skill levels as well as a ninja training center for the bigger kids age 14 and up. For more information, click here. Want to see some of Columbia County’s most spectacular views? Then hit the water via kayak! Kayak rentals and tours are available at Savannah Rapids Park, River Side Park, and Wildwood Park through these vendors: Savannah River Kayak and Outdoor Augusta. Want to teach your children the art of problem-solving, collaboration and working under pressure? Then take them to Mastermind Escape Games for family bonding where you will need to work together to find hints and clues to free yourselves from the themed room. There is a game for every skill level. For more information on the game themes and tips for escaping, click here. If you have a budding artist, bring them to Artsy Me Ceramic and Art Studio where your littles can let their creativity flow. You pick it. You paint it. They fire it. Prices start at $8 and no appointment is necessary. They also offer classes and parties. Click here for more information. Taking the whole family to a movie can be expensive but during Evans Cinemas’ Sumer Kid Show Series, admission is only $1.50 and drinks and popcorn are also $1.50 each. The series runs every Tuesday and Thursday in June and July. Click here for the schedule. Wear the kids out at The Playhouse, the area’s largest indoor playground. The facility includes a large jungle gym, toddler zone, imagination station, party room, arcade games, slot car track and nerf/paintball complex. For more information, click here. Need a rainy day activity or have a game lover in your home? Bring them to Level Up Game Center for the ultimate gaming experience. Level up has PS4, Xbox One, NES, N64, and computers. They even have Pool, Air Hockey, card tables, and arcade games.